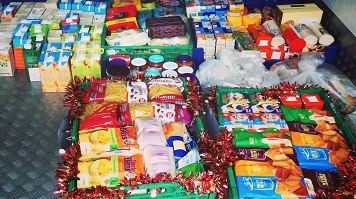 London South Bank University (LSBU) staff collected an impressive 360 KG of non-perishable food items to contribute to the Waterloo Foodbank and support local people in need over the Christmas period. LSBU’s Sustainability team, with the Outreach and Engagement team, took the lead in organising and publicising the collection during December. The University, along with a number of other local businesses in the Waterloo area, gathered donations of food from staff throughout December, that were collected voluntarily and delivered to the foodbank just before Christmas by local catering company Eden Caterers. “It just goes to show what a difference people can make when they decide to get behind a good cause and champion it. On this occasion, I’m proud to say, LSBU staff were not slow to donate food generously to this very worthy cause. “Minimising food waste while ensuring a sustainable, locally-sourced food supply is available on campus are principles the University has been striving towards over the past few years.